Water hyacinth dominated ecosystems are some of the most productive in the world, due to the plant’s natural ability to rapidly assimilate nutrients. 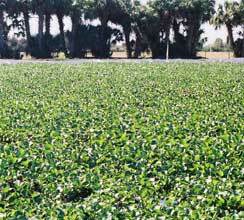 Engineered WHS™ systems create a beneficial use for the highly productive water hyacinth by maximizing nutrient assimilation while assuring plant control. The resulting hyacinth biomass is converted into marketable end-products.